what’s the health benefits can pets give? This PLR pack is all about the health benefits of having pets in the home. It discusses the fact that not only do pets provide entertainment and enjoyment, but they can actually help with a person’s physical and emotional health. They help reduce stress and anxiety, reduce the risk of heart disease, and can even boost a person’s immunity and lower cholesterol. 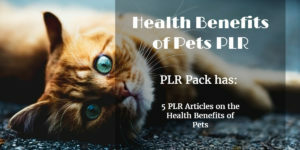 The Health Benefits of Pets PLR pack is a great way to add more content to a pet blog, health blog, parenting blog, or family blog. It is also good for promoting pet supplies, which is a really great niche to get into. You’ll get this PLR bundle for only $5.95!